Unless you’ve been living on a desert island you’ll know that London is all about the 2012 Olympic Games at the moment, and I’m personally really enjoying the events. The opening ceremony was eccentric and quirky – didn’t you just love Mr. Bean? – and the music was fabulous. So when I came across the Sport Rock Patriotic Body Wear temporary tattoos I simply had to have them. They are shaped like a heart, the Union Jack (in two sizes) and a small, medium and large star. You can safely wear them on your face or on your body and they last up to 16 hours. To apply, you simply add water on the stencil and peel it off carefully. So next time you’re off to the Olympic Village get kitted up and support team GB – after all if you can’t beat them join them! 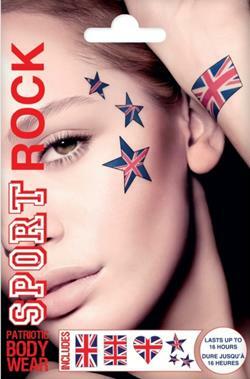 Sport Rock Patriotic Body Wear is £5.99 available at Top Shop. They are available in three designs: United Kingdom, Unites States of America and Brazil. This entry was posted in Skincare and tagged 2012, games, Olympics, patriotic, sport rock body wear, sport rock tattoos. Bookmark the permalink.